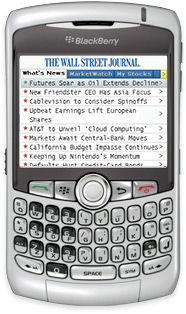 Regular readers of WSJ.com, MarketWatch.com, Barrons.com and AllThingsD.com have a better way to view content on their BlackBerry smartphones today with the release of the WSJ.com Mobile Reader for BlackBerry. Simple user interface and differentiated content tabs - What's News, Tech, MarketWatch, Columns and more - with the option to customize categories and news sources for a personalized experience. BIG PROPS go to WSJ for releasing something that's more than just a homescreen shortcut. To learn more about WSJ.com Mobile Reader, see available devices and sign up, go to: www.wsj.com/mobilereader.